An odd event could be explained by a star being ripped apart by a black hole. Something highly unusual was picked up by the Asteroid Terrestrial Impact Last Alert System on June 16, 2018. The discovery of a strange flare in the sky – brightening and fading – was reported in an astronomical telegram, which then alerted scientists. The source was named AT2018cow – based on a naming convention for transient sources where the last three letters are randomly assigned. Understandably, though, scientists quickly nicknamed it “the Cow”. Astronomers all around the world started watching the Cow, which is one of the strangest and most observed objects recently discovered. Measurements of its brightness and wavelength suggest that it is located close to 200m light years away, far outside our own galaxy. This means that the explosion would have been extremely bright to have been detected at all, producing as much energy as the sun radiates in 1,700 years. Today, a race is on to work out exactly what it is. Our new research, to be published in the Monthly Notices of the Royal Astronomical Society, has come up with one explanation. The Cow must have appeared extremely suddenly – it was not seen in a search just 32 hours earlier. 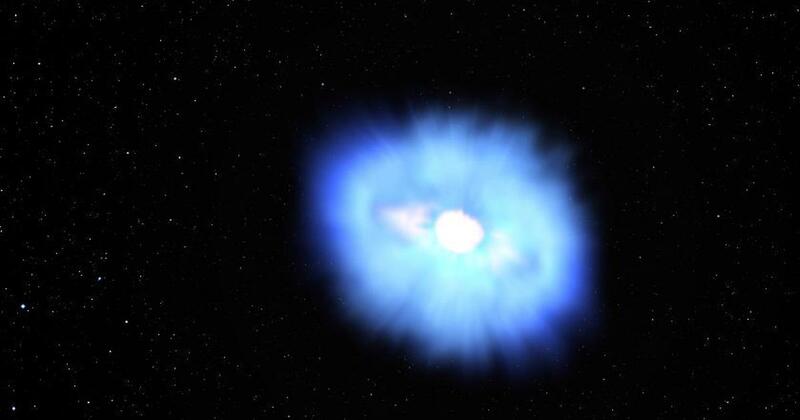 Follow up observations using instruments in space and on the ground suggested its brightness was larger than expected from a supernova (an exploding star). A gamma ray burst – an intense explosion of light – would have been another possibility, but the accompanying X-ray emission from the event seemed too small for it to fit this description. The temperature profile of the source indicated that the object was glowing at a temperature of about 26,000°C, with peak brightness in the ultraviolet region of light. Assuming the brightness of such a thermal source was a sphere, the size came out to be very large – about 50 times the orbit of the Earth around the sun. A supernova would also extend to something similar in size. A second surprise was that the spectrum – a measurement of how light breaks down according to wavelength – did not show the same features as that of a typical supernova. It was like the glow of a hot body only. Some faint but broad bumps and dips suggested there was, however, some material emitting at extremely high velocity in a cocoon around the hot glowing body. As a member of the Neil Gehrels Swift observatory (in short “Swift”) team, I was asked to dig into our data to find out more. Swift is a satellite in a low-Earth orbit which is able to point to a new source automatically in about 90 seconds after a gamma ray burst, or after being commanded to do so from the ground. Swift has many telescopes and can provide data in a range of different light regions – from the visible and ultraviolet to gamma rays. At the time, several other teams were investigating the source using various observatories. Papers based on the Swift’s X-ray data and the ATLAS data had already been published. Dan Perley from Liverpool John Moores University and his collaboration was just finishing the Herculean task of analysing the optical and infrared data from the large GROWTH collaboration – comprising telescopes around the world – following up on interesting sources. By the last weeks of August, all this research had made it clear that the Cow did definitely not fit the profile of a normal gamma ray burst, nor a supernova or a superluminous supernova (an extremely bright supernova). This left the possibility, however, that what we were seeing was a star being ripped apart by a black hole – a so-called tidal disruption. This possibility became a focus of our investigation. With the multi-wavelength Swift data in hand, and with the already published preprints providing additional insight in certain wavelengths of light, we had the opportunity to narrow the search. We decided to combine well understood physics with the observations like using the distance at which a black hole swallows a star whole, the distance at which a black hole rips a star apart, and on that basis wrote our paper. We suggest that a white dwarf (a star that has reached the end of its life) of 0.1 or 0.4 times the mass of the sun being ripped apart by a black hole of 100,000 to a million solar masses would be able to explain what we see. In fact, this would match the observations measured in several regions of light – from gamma rays to radio waves. Such an event would also provide a natural means to form the jet of material that was observed. But there are other possibilities. Two recent papers led by Anna Ho from Caltech and Rafaella Margutti from Northwestern University respectively suggest that the Cow was an “engine-driven” explosion in which a fast-spinning neutron star (a very dense star) that formed in an exotic form of supernova was pumping energy into the expanding material. 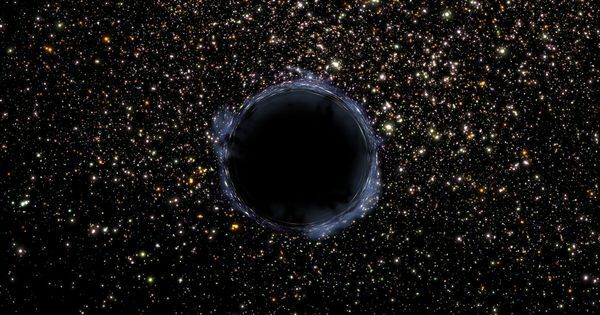 This research also leaves open the possibility that it is a black hole doing the pumping. Sadly, we missed the early stages of the event which may have contained clues as to which process can actually generate such enormous amounts of energy. Hopefully, with more and better telescopes guarding the sky, we can catch similar events at earlier times going forward. An object like this may also be a source of gravitational waves – ripples in spacetime. That means observatories like the LISA satellite which the European Space Agency is building now may be able to actually see them. Holy cow, that would be amazing.